Description: The protagonist of this opera, premiered in 1887, is no reincarnation of the ancient goddess, but a Renaissance courtesan well versed in culpable amours. According to the composer, she is a "damned soul for whom true love is a forbidden fruit; as soon as she approaches it, she experiences torture". Yet for all the innocence of her rival Angiola, the unexpected happens: "It is the bloodthirsty beast that is admirable; the sweet creature is no more than pretty and likeable." 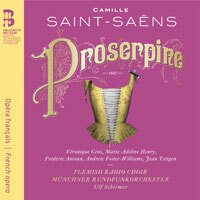 Visibly enraptured by this delight in horror, Saint-Saëns indulges in unprecedented orchestral modernity, piling on the dissonances beneath his characters' cries of rage or despair. He concluded thus: "Proserpine is, of all my stage works, the most advanced in the Wagnerian system." The least-known, too, and one which it was high time to reveal to the public, in its second version, revised in 1899. 2 CDs. French-English libretto. Véronique Gens, Marie-Adeline Henry (sopranos), Frédéric Antoun (tenor), Andrew Foster-Williams (bass), Flemish Radio Choir, Munich Radio Orchestra; Ulf Schirmer.